Many people who have serious financial problems suffer inwardly. They don’t know what to do when they reach a point where their property is about to be repossessed. Others feel disappointed and frustrated since they have creditors who are harassing them for debts that they are not able to pay. If you are in such a situation, there is a viable solution to your problem: file for bankruptcy. As a resident of Jacksonville, Florida, you may not have an idea about what filing for bankruptcy entails. Filing for bankruptcy can be very complicated, and the bankruptcy code is almost 1,100 pages long. Chapter 7 eliminates most types of unsecured debt, like medical bills and credit cards. However, it does not stop the repossession of your vehicle or foreclosure of your home. Chapter 7 also stops lawsuits and garnishments, but not everyone is eligible to file this chapter. Chapter 11 is filed by just a few individuals. It is a form of bankruptcy filed by corporations or people with very large secured or unsecured debts. Chapter 13 is a form of bankruptcy that lasts for three-to-five years. It will stop repossession of your vehicle or foreclosure of your home. It will also stop IRS levies if you owe income taxes, and you will be allowed to pay the debt over a period of five years. In general, chapter 13 allows you to keep the things you want and pay for them, or get rid of things you do not want and pay none or little of your unsecured debts. Filing for bankruptcy can be stressful and complicated, but an attorney will assist and guide you through the process and make sure that you succeed in this endeavor. Answer any critical questions that you may have regarding the process. You will also rest assured that your attorney will represent your interests in the best way possible. D.C Higginbotham is a reputable Jacksonville bankruptcy attorney. He is a graduate of the University of Florida Law School and has served four years as a Judge Advocate General in the United States Marine Corps. He has lived in this city for a very long time and deals with bankruptcy cases only. Unlike paralegals, D.C Higginbotham will meet you personally and offers a free initial consultation, lasting 30-60 minutes. Once you visit him, he will ask detailed questions about your problems and financial situation. He will also answer any questions regarding bankruptcy filing during the consultation period. 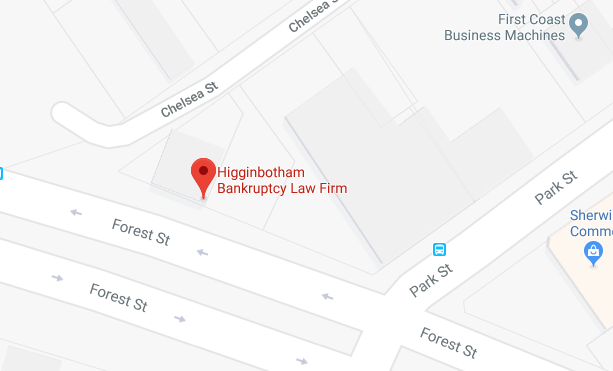 If you opt to file for bankruptcy, D.C. Higginbotham will give you another appointment in order to start the process. Afterward, he will draft all the important bankruptcy papers that you will sign later. Even after filling your case, he will always be available to answer all the questions you may have regarding the processes. You will not doubt the services he will offer to you.